I will be doing a 1 month residency (Nov 2017) at CSIRO/NMI (Lindfield).. this BLOG post will be a diary of the process. Moya Henderson (musician inventor – new instrument (Alemba).. John said it was worked on to optimise its harmonic resonance..
Paula Dawson – independent performance artist – also developed work with holography. Was an honour to meet a veteran of the Oz science community in John Lowke.. I started evolving the first Serendipity Machine (SM.i) slowly on day 1; by day three its form became clear to me.. and I had a sense of what it was.. it was sitting at the heart of the idea of measurement – like Schrodinger’s bird… I put up signs everyday.. first sign: I invited scientists to build / explain / criticise the idea of ‘what is an irregular spring.. I got involved in a discussion with a group of scientists from the National Measurement Institute (NMI).. about springs and coupled harmonic oscillators (the latter I tried to incorporate into the growing SM. My idea behind the spring is that it is irregularly shaped.. and depend on the periodic behaviour (which because of the disorder in the system is impossible to predict).. should theoretically allow different behaviours to occur.. so that it is perhaps chaotic but behaviour can be quite specific and defined.. their point: the spring will have a single spring constant so shape will have no effect.. but (my point).. it depends from what angle and tension it is being pulled at and that can be affected. Their point.. my springs are crude in that they are made of galvanised wire and not heat treated high quality springs.. so there will be significant damping.. which is very true.. the system, stills quickly after operation.. the harmonic oscillators have livened it up in that regard. I put up a sign…. (on the Thursday). : by measuring / observing the flight behaviour of a single bird.. can you know / understand the mechanics of the whole system.. i.e. can you “see” the architecture that is allowing that to happen? 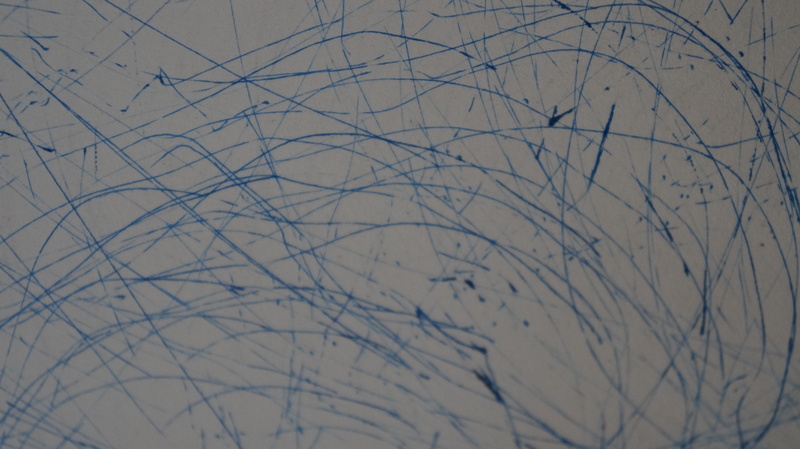 Today I run the Serendipity Machine.. at lunchtime.. make an announcement… Sholto (the press!!) is coming.. and the NMI marketing dept.. to say I am nervous is an understatement.. but I realised I have to jump in like that… I realised I am the art work too… I am worried it is going to disappoint! It will be a damp squid.. literally… but it needs to be done.. and I need to get up and announce it… processes that repeat… time / space… your machines / teleologically ‘perfect’ but all other mechanical processes that evolve in the universe.. and that could even be said to be the scientific process the evolutionary process.. evolve.. and they carry.. irregularity.. I love that irregularity… it is the uncertainty that brings about the chance encounters of beauty.. too regular it is dead… too irregular………………………………………. Come and wind up the SM.. and see what happens.. is what I am thinking. Been home a couple of day developing the next platform (photo).. and also spent whole of yesterday in bed with flu.. Ran SM.i on Monday.. and I think it went really well.. there was good turn out.. and they clapped… Sholto though it went – his words – excellently!!! – is that even a word Sholt!? I was nervous but also completely in the moment.. I watched myself carefully through the whole process and even.. I would say carefully controlled the words and actions that occurred.. quite in contrast to the erratic behaviour of SM.i.. who painted and jangled about with its nervous birds… various CSIRO staff drove my mechanical Nervous System..
Shane Keenan took me on a tour of the Superconductor lab.. got some beautiful material.. together with old defunct pieces of equipment that Katie gave me.. there is definitely a poignancy and beauty in the exquisitely machined pieces of equipment.. that had a certain purpose that is no more. Been put to pasture.. so to speak.. I sincerely hope I can do them justice. How do you take an exquisite thing with a presence of its own and incorporate into SM.ii so that SM.ii is not overwhelmed by its presence and it becomes something greater.. as an appendage. Saturday morning.. just after 6 am got my coffee and there are some birds chirping.. I feel still thick in the middle of things.. developed SM.ii which was a more solid construction than SM.i.. was more contained.. didn’t need a scaffold and was a more ambitious construction that I should be able to build as a more permanent structure.. it is my old work table with bicycle cogs integrated into it.. it ‘makes’ its own scaffold. I am very proud of this mechanical.. as a constructed object. I worked on it all week and set it up while still evolving it at AIP / Industry Day and by the end of the day it was working well.. Got a good video of gary jones running it.. he would like me to replace the existing bird with a FLEDGE bird… strategically I think that is a good idea and I will do it! My final objective is to set SM.i alongside SM.ii and have them do an interactive drawing.. someone operating (i) and someone operating (ii) and then depending on the way you draw (turn the mechanism) some drawing should emerge that is a combination of (i) and (ii).. I am keen to do this as it was something I had initially though would be a good idea.. and more importantly one of the scientists (Ian) suggested it and I would like to honour that. At CSIRO AIP day had great interaction with Ann Haines (learning and development consultant at CSIRO.. who I think recognises the value that kind of ‘machine learning’ can bring..
Rchard Savoie Founder / CEO of StayBil (Stability through Mobility) – associated with FLEDGE and Steven Davey (who spells his name right!!) and is a senior mentor at FLEDGE.. I suggested to him and Gary Jones that they needed an on board artist – i.e. me. For a period of time.. I must follow this up! Both these guys and Gary Jones ran SM.ii and it was great.. Steven gave it a hell of a crank… interesting to see his upfront vigour.. it was terrifying.. but necessary! !1 I think the latest iteration of SM.ii would have handled it..
Caled Chahine: ‘It’s got something.. reminds me when we were young – discovery – no judgement’.. I paraphrase the essence of what he said..
Tuesday 14/11/17 Things that are sticking in my mind.. visit to Grieg Small.. last week.. he has the lab (NMI) that developed the standard for electrical capacitance.. all about geometry.. if you get the geometry right you can calculate the capacitance.. don’t need to measure.. which is a powerful idea to get a primary standard.. he then went about showing me the process of getting the geometry right.. having to smooth down (polish) metal tube.. to within nanometre smoothness… this is very fine scale geometry,.. 4 months of scientific polishing.. this goes generally unappreciated.. but there is great pride in that lab.. in the 1960’s… to be confident about your reference frames you had to put the thing in a ship.. and off it went to England.. probably changing on the way.. So the day I arrive.. John Lowke who was the ceo of CSIRO (if that’s the right title??) in the 1980s.. he came to tell me about the heyday at CSIRO.. in the 80s.. when the oz govt provided much funds for art science collaborations… one of the artists.. a musician / inventor.. had invented an instrument called an Alemba.. which needed some physics intervention… to get it happening.. I managed to track her down (not that hard.. admittedly).. but the upshot is she is going to be at the finale on Thursday at Lunchtime.. John Lowke.. a real veteran.. will introduce her… it’s a beautiful story of the (truncated) history of art/science in oz.. and she – to me – is a great story… unrecognized… and this is full circle stuff.. bringing it all back home as Bob would say. After a pretty sleepless night of letting dogs out and dreaming that I had the machine precariously set up at some unrecognizable house… and then realizing I would have to move it to CSIRO.. and then nearly getting into a traffic accident with my dad who unexpectedly appeared before my eyes.. thankfully I awoke to a sleeplessness that would not let up.. This morning I sat up on the deck with the best cup of coffee I have had in a long time.. milky slightly sweet.. I realized what the restless spirit of SM.ii was… its name appeared to me.. ‘the scientist’.. and all the anxiety left me to be replaced by elation.. its moodiness.. its resistance to being manipulated / told what to do.. its spirit… fiercely creative when left to its own mechanism.. I felt proud of it.. and I felt it recognized many of the scientists I had recognized.. there tendrils and wiring.. I will be proud and convinced to stand up later today and announce: “The Scientist”.. and have it interact with SM.! Another point to make – John Lowke – former director (in the ‘80s).. opened the finale.. it meant a huge amount to him to have Moya there and to open it.. and it meant a huge amount for Moya to be there.. this was patently clear… and a novel and completely unexpected and beautiful outcome to the proceedings. Another point worth noting.. Ian (White?) brought me a mini-machine he had made.. polar motor Battery coupled to a magnet.. coupled to a copper coil – copper coil turns.. he made this and brought it for me to see.. another beautiful gesture I felt. The SM (that therefore included me).. I think could be said to be part of CSIRO/NMI, but until the scientists interacted with it – they were not part of the mechanism of the Serendipity Machine. That changed for me in a poetic an beautiful way on the day of the finale, because as SM.ii was failing.. as ‘the scientist’ was failing.. the scientists got involved to ‘make it work’ they became part of the mechanical success of the system – they became truly a part of its mechanism. The inescapable fact of our motion is responsible for all that we are.. somehow locked into our basic mechanics is our need to reach for each other.. to extend beyond ourselves. The scientist in me built this machine to help get to the heart of this mechanism. where the dots (.) indicate seconds.. 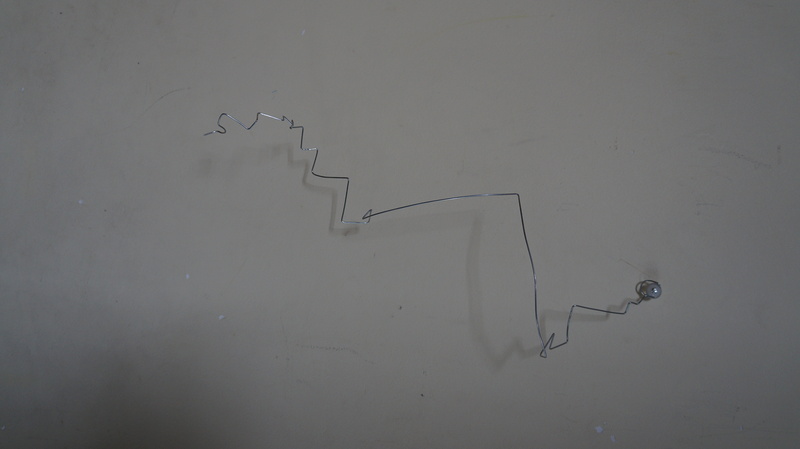 This was converted into wire, where the points of clang were randomly bent in any direction. This is an embodiment of a tiny aspect of the Mechanical’s behaviour.. it was reattached to the machine.. directly linking the pen to the triangle and allowed to operate for a few minutes… its new behaviour.. whatever it was .. was now in some way directly influenced by its past behaviour not unlike ourselves where our own past behaviour is going have a feedback-ridden effect on our current behaviour.. The current behaviour was tracked by directly measuring the main pen held by the turntables. The pattern.. is circular as expected.. but some wobble has been introduced by the interaction with triangle. This behavior is affected by the physically manifested time data incorporated into the linking arm. Yes.. that’s better.. isn’t that so like me.. 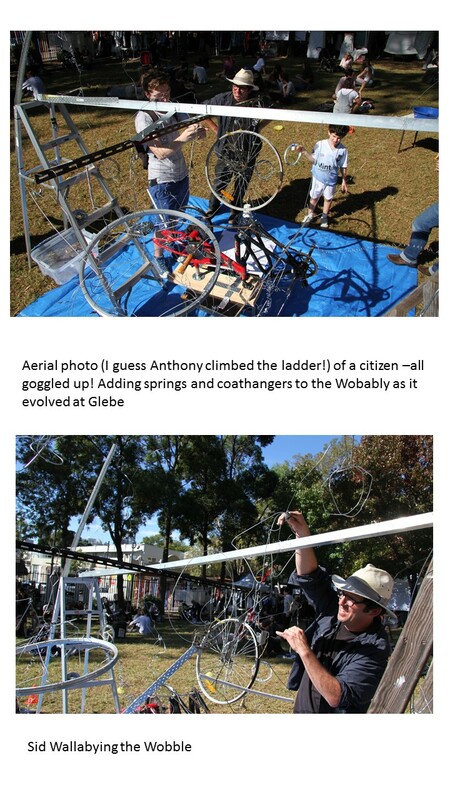 So I got asked by the Illuminating Waffles if I would like to do a performance art piece at the Glebe Markets… and without really thinking about it I said.. sure… why don’t I build a machine…. 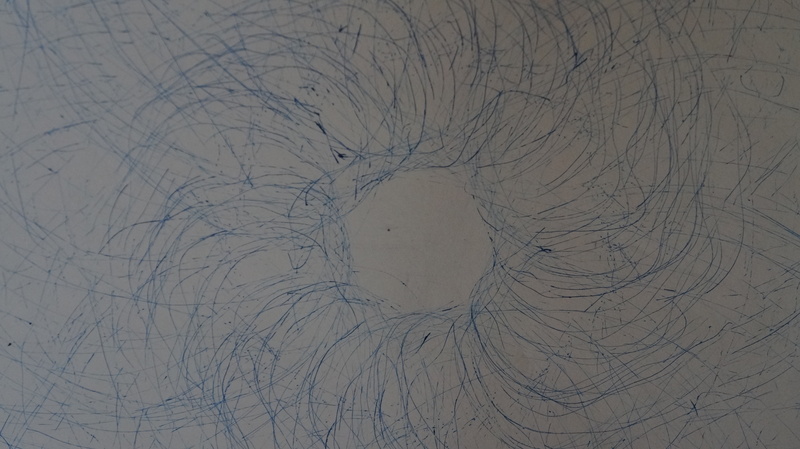 I was feeling very excited at the time about the idea of circles and persistence… this is the idea that for anything to persist in the world.. at least persist in a way that we – an observer – are able to see it.. there must be a circle aspect to it. By circle aspect I mean it there must be movement and there must be return – thus the circle.. i.e the movement has to return periodically to where it started if there is to be any hope of persistence.. i.e. things that don’t do that just dissipate… if things persistently repeat in this circly way.. there is a possibility to build on it.. ie.. something else can come and collect around this persistor. There can be some sort of growth.. / accumulation. I was excited by this idea and I was also thinking that that is also all that evolution is… except that what keeps returning to the start point is the repetition of generations.. and when it does that there is some action upon it which allows variation… this introduces the important idea of the wobble… I had been interested in this periodic behaviour with the possibility of introducing irregularities for a while.. ever since my collaboration with the quantum physicists… I loved my – The Atom machine – .. the two record players that drew… and since they were out of phase the patterns reflected that. I was into the idea that it was really interesting that such a simple behaviour (just two spinning circles) could produce a reasonably complicated image. Maybe this idea had some relevance to a living system? I really did not know if this was true or not, but what I do know about living systems and probably anything reasonably complex.. it usually starts out as the repetition of simple steps, and in this process, subtle irregularities are introduced which may amplify over time. 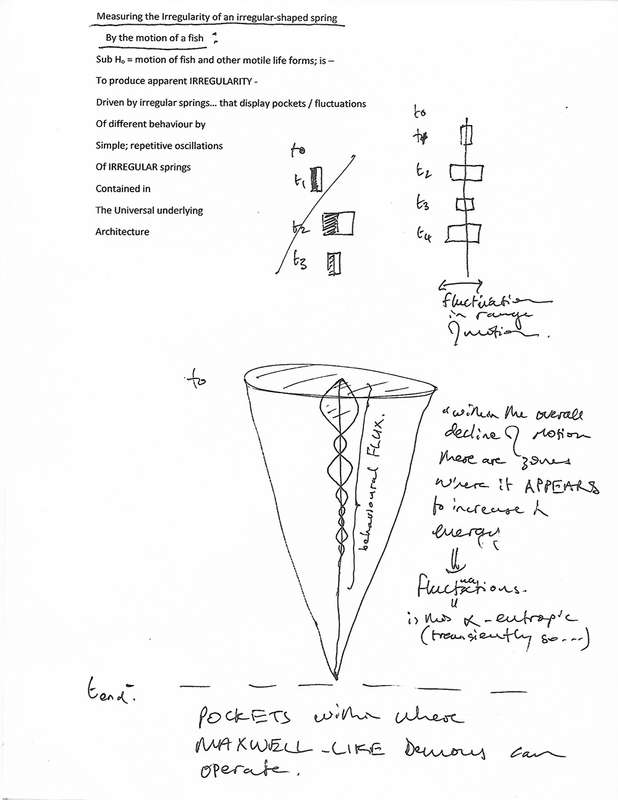 The machine as I had it – The Atom – was very regular – not much irregularity.. Then I started to play around with ideas on how to introduce irregularities… The first generation of such a machine I called Evolver. 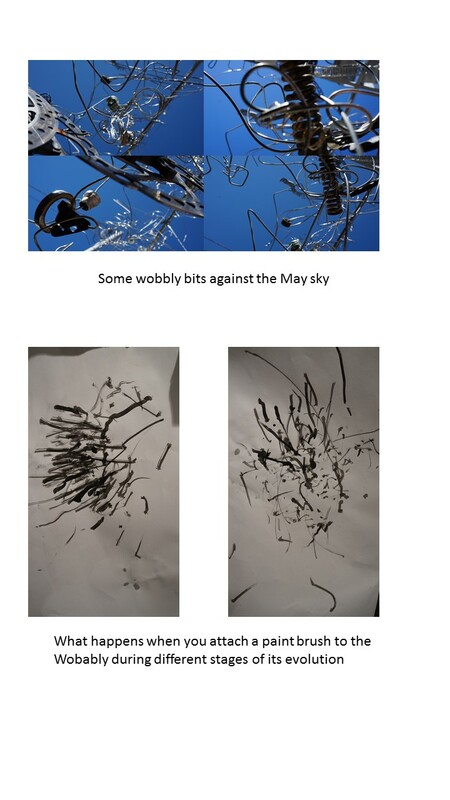 I allowed the pen of The Atoms’s turntables to smash into the corners of a suspended tri-angled mobile.. which was made of bicycle wheels and umbrella bones. The mobile could rotate but was also pendulous. 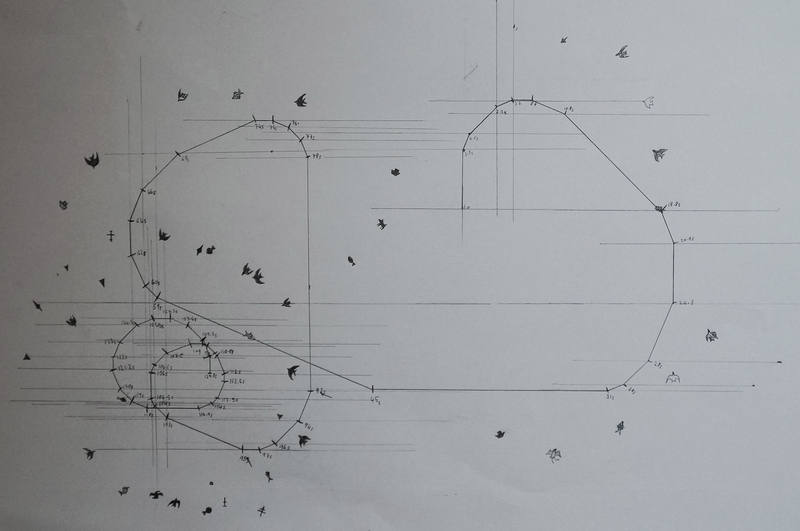 I analyzed the movement in drawings and the data looked chaotic. At least.. since it was localized in the structure.. it could return, but when it returned it did not seem predictable. I became excited by the idea that a very regular action (which The Atom has) can generate disordered motion in another system that interacts with it. I liked this metaphor for evolution. Where the regular return of the turntables has an unpredictable outcome.. at least if you record the motion of the pendulum / mobile. I showed off this creature at the CSIRO Innovation Day in late 2016 and enjoyed a thrilling moment when an elderly physicist – who seemed less than impressed – witnessed the drawing arm coming apart. I noted to him that like any system it has a catastrophic point – which may not be obvious when that is going to happen, i.e. every system has some / many possible breaking points and he was fortunate to witness one such point.. funnily enough I think that got him on board – although I may just be being optimistic about that, but nonetheless I liked the metaphor that for some really hard to determine – reason, the system can just suddenly collapse – a CATASTROPHIC POINT. So by the beginning of this year (2017) I was really excited to build such a persistence machine. For the persistence the core idea was Circly… an action that repeats in time (and space – for that matter).. like a wheel.. The first such machine… I called my!machine. It had.. at its mechanical core a part of a bicycle spliced to a steel chair. The bicycle was the mechanical core because the pedal that drives the back wheel is what powered my!machine. The regular mechanical wheel had an umbrella stripped of its material attached to where the other pedal should have been. 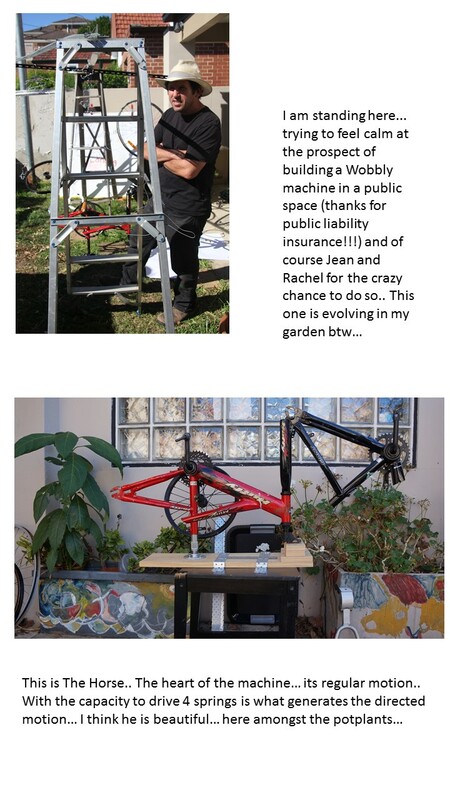 This umbrella had a lot of motion (revolved with main core wheel) but also a little bit free to rotate – (although I have subsequently reduced that freedom, by clamping it more securely).. the umbrella arms have flexibility to their movement and they in turn interact with other components coming off the bicycle and chair frame. Much of the interaction is spring-based. Springs allow a certain flexibility of movement, but with this property of a return to where it started. Springs themselves hold to this circly principle. Initially an unwound wire has far fewer -is it degrees of freedom? – than a spring coiled up, which has more freedom in its movement (is this true? Is it not the other way around?? – springs are more constrained.. and have therefore less degrees of freedom.. but the energy constraint means much more of its possible energy is directed in a very specific way!). I was again, interested here to see what kinds of irregular motion this regular wheel could generate. 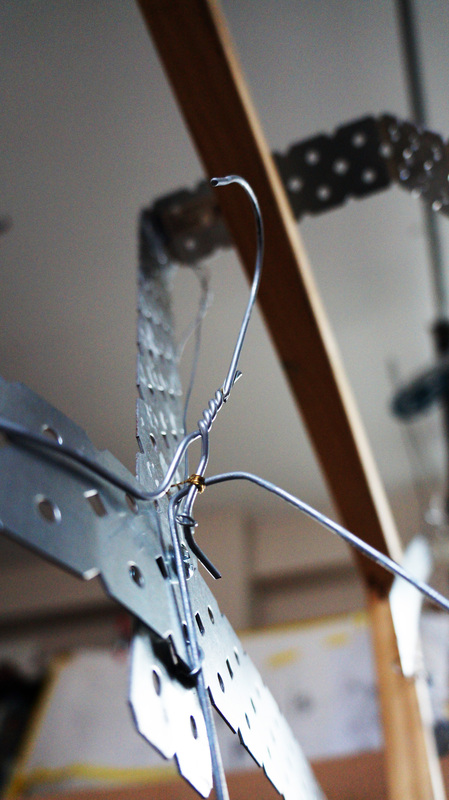 I started using the roof scaffold of my studio to extend the size and complicatedness of my!machine. This allowed structures to interact with my!machine which were technically not physically attached to its core but could interact with it. Not unlike the pendulum of Evolver. It made me realise that things don’t have to be physically attached to anything to be part of it. In this way a community, for example, are just an extension of an individual. If one thing can quite simply cause the motion of another thing it can be said to be part of that thing. This reality would be enhanced if the interacting thing fed back to the core structure in the nature of its motion. In some sense there could be said to be some feedback in my!machine’s componentry, in that the behaviour of one connected spring will receive a signal from a preceding bit; have a responsive behaviour that will affect the connection to the preceding bit; and affect how it receives a signal from its receiving bit. However, since the system is ultimately dissipatory – the peripheral bits will always have much weaker motion than the initial core because of the entropic nature of the system (much of the movement is lost due to the necessary flexibility of connection). For this reason, the feedback is too weak to have much effect – most likely. This point was made to me by Tibor Molnar – science philosopher, over a coffee. Probably the most important building principle applied to the construction of my!machine was the idea that all connecting bits should be flexible – which I later called the wobble. The Wobble, is a beautiful idea. All living dynamic systems that can change need to have a wobble at their zones of interaction. To organize and facilitate a successful interaction, which at its heart is uncontrolled, the motions need to cover the potential space of interaction comprehensively and erratically to encounter the unlikely moment which accommodates the two components connection. This is not necessary in our world dominated by the machines we make, which goes along with a very different design principle, which is highly engineered to spec, because we know what we want from it we know what we want it to do. Most natural machines /systems are not teleological in that way so it is maybe a hard principle for us to get our heads around. As I built my!machine I noticed, viscerally, that I was making a self portrait. 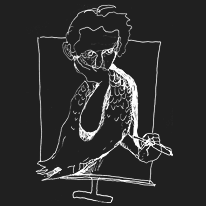 I felt it was a far more convincing self portrait than those that I have drawn in the past. I felt it approached, not what I looked like, but pointed rather to, and uncovered the nervous probing wiry architecture that lies a step removed from our physical selves. It is somehow, more the idea of what we are. The architecture. Its jangly motion. Where it probes space at its peripheries feels true. I like the idea that we are driven by a mechanical process, but that mechanical process drives many other process that are far more jangly, far less determinable. Evolution may have favoured those processes that make the jangliness more likely to encounter a solution – but where the specific solution itself is impossible to have hardwired because our ecological interaction with the external world is impossible to predict at the lower levels and it would require a determinism that is hard to justify that is in keeping with the principle of least action. It may even be fair to say that evolution is the process of tailoring the jangliness to make it seem much (much) less jangly… and organized. Too much Wobble.. the system will CRASH!!! I should run through the events of the day for the most part, for me to try sort out in my own mind, what this is and where it is and where it is going. I say ‘what this is’ from an aesthetic point of view. I am an artist – I can say this because I have often made paintings and many in a public setting. From this I have a sense of what a good successful painting is. You can see the craft in it you can see how the composition holds together. But what is the WWTWP and why does it matter? The question comes from the point of my unease in assessing it. When I am presented with a painting, I have many cues and references with which to see the object and classify it and therefore place it somewhere in the catalogue of my mind that makes sense. But The Wobably does not want to sit in that same catalogue. It is like an evolved phenomenon trying to inhabit a niche that feels to me, undefined. A niche is an ecological opening that is defined by the properties of potential occupant that can inhabit it and by the properties of the ecological space – the interaction between the two. This is partly why I want it to inhabit places of science (social, biological, physical, systems). I walked past the Power Institute at Sydney Uni the other day and thought it should sit there. It would have a lot to say about the unintended consequences of wielding power. As a phenomenon.. or.. really.. a thing.. the only useful criteria with which it should / could be judged by: ‘is it transformative?’ Does it affect / change the way we see / feel about evolved / evolving things? – like ourselves; Do we get empathy and understanding.. through it.. of such things? That is what I would like my Wobblies to achieve.. I can’t impose that. But that is the result I seek.